The New Year has started off with a quick stride, leaving little time for our peripheral intentions to make the final cut on the to-do list. However, today, we were gifted a quiet day at home due to the snowy Winter weather. While six to eight inches of snow sat awaiting redistribution in our driveway, we convened in our living room to connect and remind ourselves of the importance of holding space for one another to share this family experience. I didn’t want to let the month get away without recognizing January as a threshold for, not only a new year, but, the opportunity for new intentions; new visions; new energy. We started with a few deep breaths… bringing our minds to the present moment. Then, as is customary at the onset of a new year, we discussed goals, or rather, our visions for the subsequent months ahead. With this visionary spirit, we opened the circle. These words gave us pause to reflect on those things from the past that we want to put to rest, and where we want to direct our energy as we renew our intentions for this year. During our discussion, we reminded the kids, and ourselves, through our words, and the insights of others, that our lives, are indeed, our own creation, and that the ultimate responsibility for our happiness lies in our own hands. Next we watched a short YouTube video recently posted on the SpiritScience channel about “Source Energy.” This offered a few moments to discuss the interconnectedness of all things, and despite our individual responsibility to create our own experience, we, ultimately, all play a role in creation. 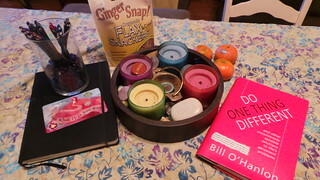 Lastly, we spent a few minutes, each writing our intentions for the year in our family journal, and reading an excerpt from a book, titled “Do One Thing Different,” by Bill O’Hanlon. The concept of small actions creating big changes is the premise, and the book contains some inspiring tidbits to jumpstart the process. We talked about the “stories” we tell ourselves about who we are, and how they often, have nothing to do with who we REALLY are, but are just residual energy from past experiences that we haven’t taken the time to filter properly, integrate if useful and discard, if not. The table, now littered with flax cracker crumbs, sweetly-scented peels of clementines and colorful ballpoint pens, and aglow from the candles in our centerpiece, was itself, folding legs and all, the centerpiece of our family connection today. Its eclectic dishevelment and bits of inspiration and creativity were clearly outlined and encompassed by our five separate energies, thankful for connection, but eager to disperse our individual focuses once again. Thus, with that, we closed the circle, reminding ourselves to be visionaries in our own lives and go forth into the New Year with consciousness, clarity and intention. With the Winter chill exuberantly dancing around our house, we will look to the Sun for inspiration. Fierce Spirit of the Sun. I call you into my life. May I stand fearless in the protection of my community. May I lead in balance knowing when to roar and when to walk nobly away from unneeded conflict. May I learn the value of silence. Waiting patiently for opportunity to show itself before taking action. Invisible hunter, teach me to trust my instincts and my creative strength. Lend me your clear vision that I might bring forth the gold hidden within my Self. The light does not go out. It is transferred to each of us; to share and to hold, and to bring with us when we next return.